Knights of Creativity Spirit & Ale: "Citius, Altius, Fortius" : Faster Higher, Stronger. "Citius, Altius, Fortius" : Faster Higher, Stronger. In keeping with the present Olympic ideals, and a further chapter to a previous blog on the KMSA, a controversial Scottish brewery has said it has reclaimed the title of the world's strongest beer from German rivals - with Sink the Bismarck at 41%. BrewDog, of Fraserburgh, made headlines last year when it unveiled a 32% beer called Tactical Nuclear Penguin. However, Schorschbrau released the 40% strength Schorschbock. 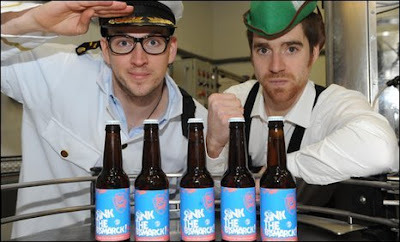 BrewDog said its newly released 41%, Sink the Bismarck, would cost £40 for a 330ml bottle and would only be sold online. Alcohol Focus Scotland had previously expressed concerns about BrewDog's approach. Alcohol Focus Scotland chief executive Jack Law said: "Over the past few months BrewDog have continued to produce stronger and stronger beers. "By commenting on this irresponsible brewing practice we only serve to add to their marketing and therefore we have no further comment to make." But BrewDog's managing director James Watt said the company was doing all it could to promote a new and responsible approach to beer drinking. He added: "It's ignorant to assume that a beer can't be enjoyed responsibly like a nice dram or a glass of fine wine. A beer like Sink the Bismarck should be enjoyed in spirit-sized measures." BrewDog was previously branded irresponsible for an 18.2% beer called Tokyo, which it then followed with a low alcohol beer called Nanny State, then Tactical Nuclear Penguin. For my own part, tonight I have decided to treat myself to the "Best Ale in the World".....well who could resist that come-on line when its printed on a bottle amongst a row of beers. This is just a modest 8.5% Old Tom from the Robinsons brewery in Stockport, and with a first few sips, I can say that at just £1.69 ( $2.70 ) for 330ml it is a rather splendid Winter warmer and very very delicious. I have chosen to pour it into my very own Character Glass, I got from the MidTown Tavern in Harrisburg Pa many years ago..... that of a pants down Full Moon ( yes, real class from the USA ) and no doubt, after a long hard day at work, having this with my evening dinner will mean that I will shortly be spark out on the couch, ready to take on the world again tomorrow. Well, I certainly wish I had a bottle or two of Sink the Bismarck for Mardi Gras tonight (strong beer; weak label IMHO). After all, what better night to partake in the fruits of "irresponsible brewing practices." I could sign up for a stent on Bismark!